In this section you will find all your Replica Medieval Armor Needs! We have Replica Roman Gladiator Armor, Roman Period Armor, LARP Armor, Functional Armor, Re-enactment Armor and Decorative Armor. We have Gorgets, Arm Guards, Breast Plate Sets, Shoulder Guards, Lorica Segmentas, Leather Muscle Armour, Scale Armor, Greek Armour. Even Helmets, LARP helmets, Arms, Pauldrons, Full Body Armour, Leather Greaves, Horse Armour, Windless Armour and Japanese Armor. If you can't find it, let us know! Decorative Armour Medieval and Renaissance Armor. Decorative Suits of Armour, Decorative Breastplates, Gauntlets, Miniature Suits and Decorative Medieval Helmets. Functional Armour for use in Re-enactments, Theater, Movies, LARP, Medieval Fairs and the SCA has to be able to fit all kinds of situations and meet group guidelines. We carry all types of functional steel armour to meet these needs. Red Dragon Armoury is a UK based designer and manufacturer of affordable HEMA gear. HEMA (Historical European Martial Arts) is a growing community of dedicated martial artists recreating the techniques and traditions from the fighting schools of Europe. Welcome to our pages of Historical Helmets. A wide variety of Helmets from Roman, through Medieval and into the 20th century. Great for period re-enactors, stage and theater, LARP, and collectors. There are many types of padded armor and gambesons. 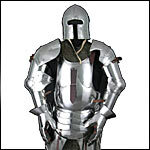 Padded armor was worn under mail shirts and plate armor to protect against injuries. Our Polyurethane Armor is the Highest Quality LARP Armor available on the market today! Armor and helms for LARP, live role play, re-enactments and motion pictures. Armour that will Not Rust, Dent or Corrode.